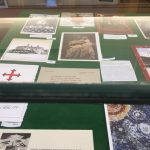 (mounted in the library), and many woodcuts. 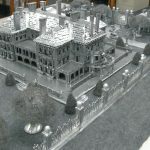 As a crowning achievement, unrelated to art, in 2002 she opened Star of the Sea, an elder friendly housing building which was a refurbished former estate and convent on “the Point” in Newport. She had worked for many years to raise the funding for the project. 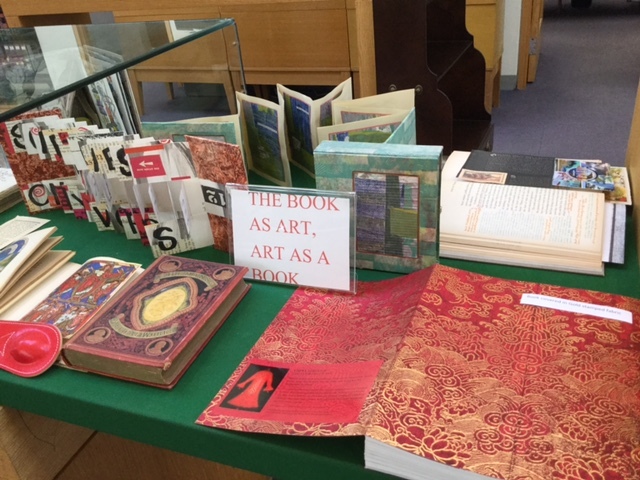 This display was a graphic illustration of exceptional artwork used to create and be included in the creation of a book. 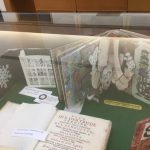 In the case were original art books by Judi Israel and a “tunnel” cutwork book (papercutting) called Scherenschnitte entitled “Let it snow” by Marie-Helene Grabman. Particularly interesting illustrated covers were also included. 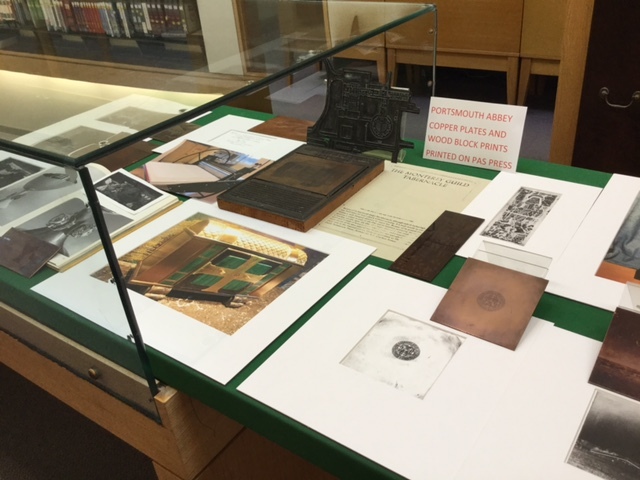 During the winter the Library director found a box of old copper printing press plates. 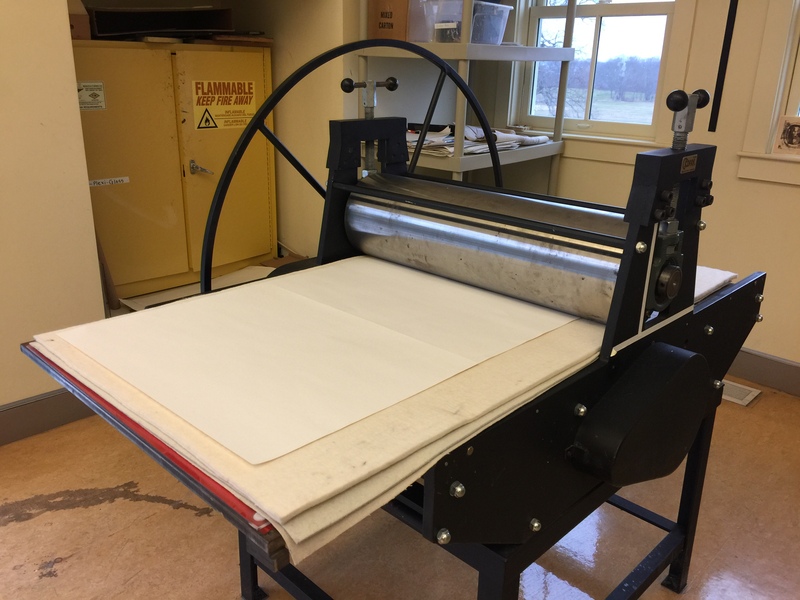 They were cleaned and using the art department printing press, Library assistant Isabella Cassleman and Art teacher Kevin Calisto printed them. One of the more interesting pieces in the case is a subscription offering by E. Euphemia, “Effie” Charlton Fortune (1885-1969) for the Monterey Guild. 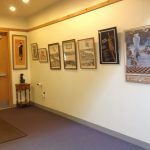 In 1942 the artist moved Monterey Guild to Kansas City and in 1944 she moved the Monterey Guild to Portsmouth, R.I. at Portsmouth Priory where she taught, then in 1953 she moved the Guild back to Kansas City. 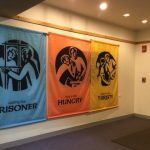 She served as artist-in-residence at Portsmouth Priory (now Portsmouth Abbey School) in Portsmouth, Rhode Island, and designed the tabernacle that now resides in the Abbey’s Church of St. Gregory the Great. 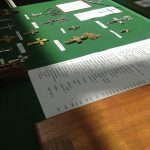 She had made a plate of the description of the Church Tabernacle altar located in the church, offering an 18 inch high piece for sale, (price on request), as a subscription, through the Monterey guild. 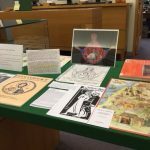 Included in the case in the case is the print a very early prize day invitation from either1931, 1936, 1942, 1953 or 1964, a print of the monastery building with bell and a print of a cross (monstrance) she designed for the monastery. There are other works of the artist on the campus, two sculptures of Christ on the cross on a pole with two standing prayerful figures on each side. Miss Fortune is believed to be at the school from about 1945-1950. Photos show her with faculty in 1949 with one of her more famous painting behind the group. We are grateful to Eileen McGuire for purchasing Colors and Impressions The early years work of E. Charlton Fortune, Monterey Peninsula Museum Exhibition, Sept 23-1989-1990 and E. Charlton Fortune 1885-1969, from the Carmel Art Association , which created it for exhibition of Fortune’s work Aug 2-Sept 5, 2001. Eileen also purchased a video (VHS) which we have. 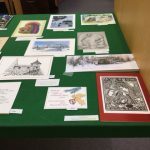 For the holiday display an assortment of professionally produced Portsmouth Abbey Christmas Cards were on display. For many years the Monastery produced a plain card with an appropriate religious or serious literary holiday message (usually done in red or green calligraphy) and with no art work. Later art work was added when the development office began to produce cards with Abbey scenes for the administration and monastery to send much later. These were works from around campus or done by a student or alumnus. April 23, 2016 is the 400th Anniversary of the death of Shakespeare. 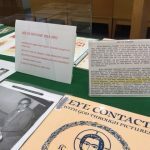 Father Damian Kearney, ’45, former head of the English Department, has prepared a display of Shakespeare photos, posters, books (including a facsimile of the first folio) and items related to the great bard. Father taught the plays for many years and continues to listen to and watches the various productions with enjoyment. 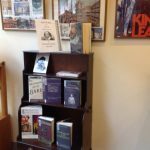 Among the items in the hallway cases are the 1899 theatre program of Hamlet with female Sarah Burnhart playing Hamlet, an original 1919 program of Hamlet and an original 1922 program book from the Harris Theatre with John Barrymore as Hamlet. 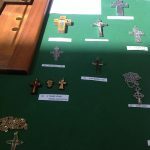 These are part of a monastery collection from now deceased, Brother Basil Cunningham. 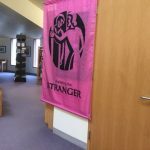 At present the library holds over 140 DVDS of Shakespeare’s plays. 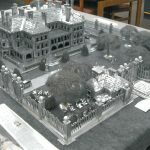 The hall display cases held additional three dimensional objects. 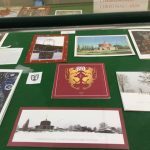 The library display case is featuring our two sets of creation located mosaics on campus which will remain up through alumni weekend. The one pictured (part of a set) below has been installed in the science building. Jez Coulson took photos so they could be added to the case. 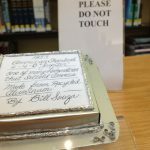 These were done by Mrs. Ruth Ann Pertree of Newport. She opened Quasivecchio, a decorative arts studio in Newport, RI. 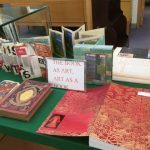 Using her unique creative talents, were she produces work that showcase her love for mosaics as well as her proven skills as a bookbinder and paper maker. But she produces some of her most significant work in mosaics. 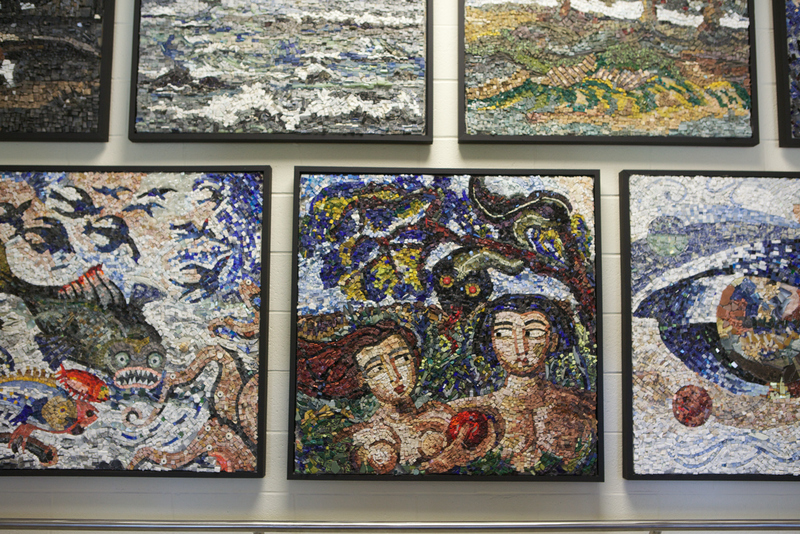 Ruth Ann’s most inspired work is an evocative series of large mosaic panels depicting the seven days of creation as recounted in the Book of Genesis. 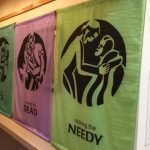 These mosaics were prayerfully donated to the Order of St. Benedict and hang in the permanent collection at Portsmouth Abbey School in Portsmouth, RI. 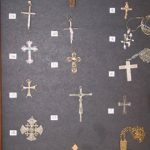 The second set is stored in the monastery for many years were displayed on the wall of the library. 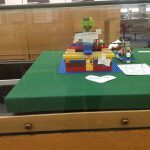 Our students held a Lego building block competition and the results were displayed In the library in February. 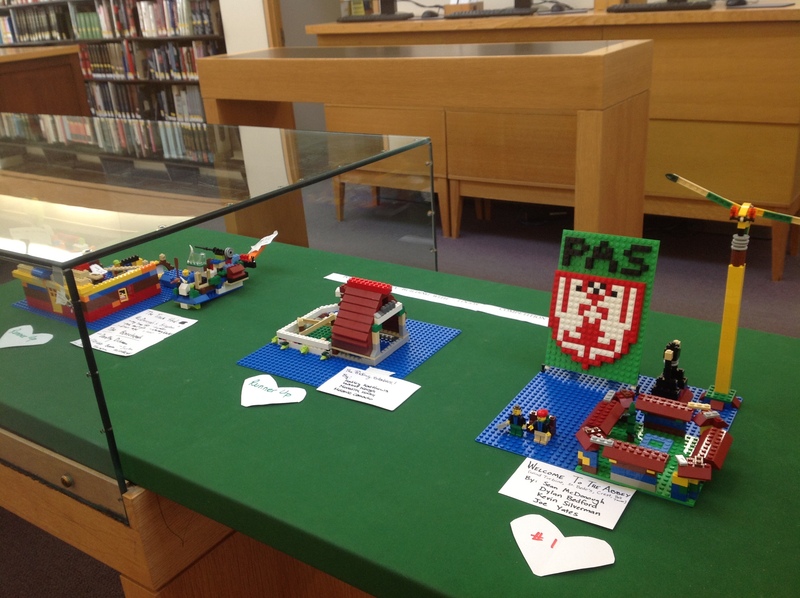 The winner was the PAS shield, building and wind turbine on campus. 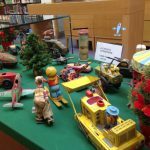 ​The library has on display a group of toys made for children 75 years ago. 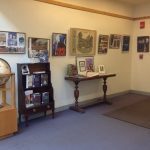 The examples are from the collection of Tom Casselman, husband of Abbey Summer Elderhostel art instructor, Izabella Casselman. 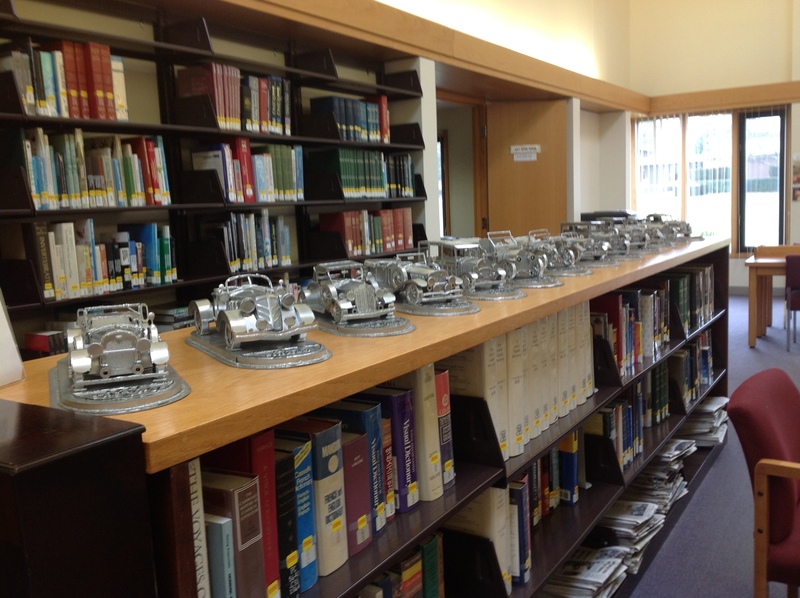 The toys are all tin stamped, and run with keys, gears and pulleys. Most were made in the USA, although some are from China, Japan and Russia. They come from the period of 1930-1940, although one is from the period of the First World War and the a few late examples are from the mid-late 1940’s. The skiers, ski, the pirates and animals “walk”, the tanks and airplanes shoot fire by means of a striking flints and the motorcycles and submarines balance to run on metal or early rubber tires. A jester does black flips. One motorcycle is marked “made in US zone, occupied Germany”. 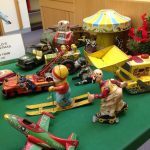 Such would have been the toys of our Portsmouth Priory young men in the early years of the school’s history. 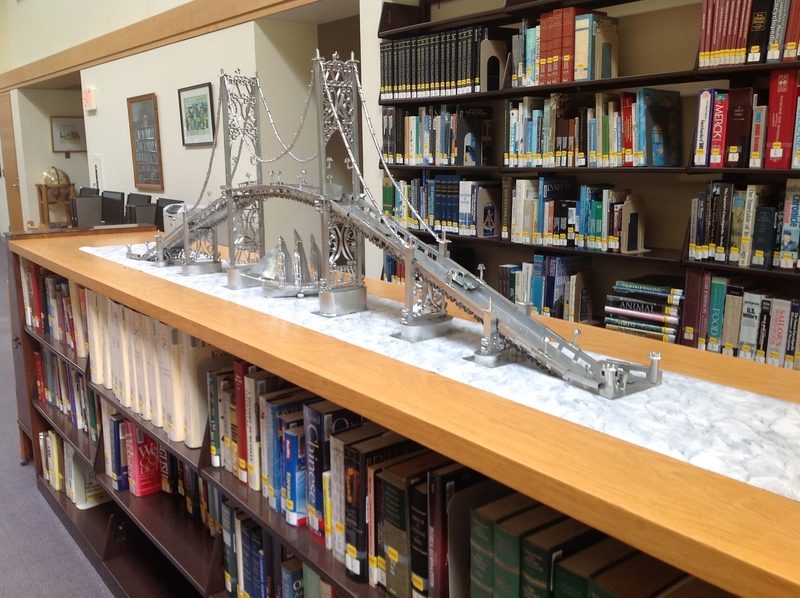 The School Library has a display of two structures, the Mount Hope Bridge and The breakers in Newport made by Mr. Sousa. Bill Sousa, age 86, retired from Raytheon lives off Cory’s Lane. He was featured in Yankee magazine in 2001. 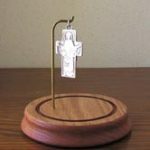 His doctor told him to get a hobby forty years ago, and creating items using scrap aluminum became his hobby and passion. So for 45 years he has been working with aluminum cans, sheets of foil and even steel wool (for the trees). 0ne of the first structures was the Mt. Hope Bridge but there are many cars, crucifixes, and a large battleship also. The Breakers has been “being finished” for 10 years, on and off, as the mood moves him. The largest is perhaps the whole of the Breakers over 7 feet including the landscaped grounds, one of the tallest the Mount Hope Bridge. He landscaped the Breakers with its the beautiful fence with the ball caps on the pillars, the famous gates and driveway with period cars which he thinks is the high point of that piece but unfortunately it all did not fit on the library case so I have pictures of the completed work on the felt near our minimized display. Addition structures we placed on the cases. 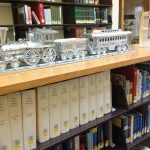 Cars and a model 1855 train were added by Mr. Sousa. 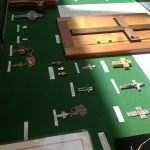 This Lent, as was done for Lent 10 years ago (2002), we displayed Father Christopher’s (Father W. N. Christopher Davis ’48 ) collection of crosses. 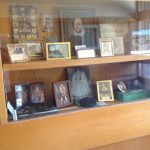 Also added for this newer display were two belonging to Father Damian Kearney, O.S. 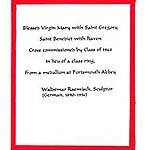 B. and the “Portsmouth school cross” (from school letterhead etc.) now sold as a silver or gold necklace in the school bookstore. 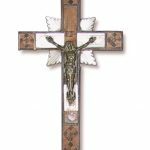 As described in 2002, “Wood, alabaster, paper, silver, glass, mosaic, cameo and gold crosses are represented. 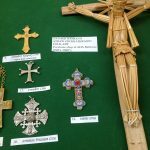 One cross is made of house nails, another of silver tubes, one has a papal portrait and yet another has splinters of wood encased in glass. 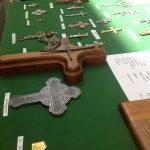 The artistic forms of the crosses are varied as well, showing a crusaders’ cross, Celtic cross, an Armenian procession cross, a Byzantine cross and Trinity cross.” Added this year was a straw cross and a second reliquary cross, this one once owned by Father Damian’s great uncle, a priest in England in the late 1800s. The mosaic (the first picture below) won in student voting this year, as it did 10 years ago. It is also pictured in the collection in another photograph. 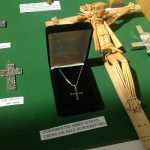 Second place was tied between Father Christopher’s 33 Anniversary Cross (large raised center cross made with varied polished woods) and the Irish Blessing Cross shown in the center of the last picture. 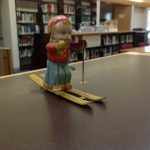 A sample of nativities made from olive wood, glass, metal, stone, and paper were on display for Christmas. 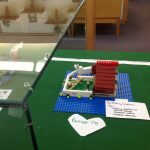 Two children’s pop-up books created visual depth. Of special interest was a small silver pin with the nativity. 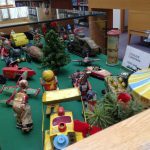 This exhibit is a compliment to an earlier exhibit Pop-Up Paper Nativities (Winter 2004-2005). 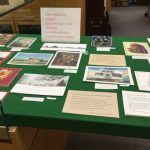 During December 2004, the exhibit is a display of 30 or so paper nativities loaned from the collection of Father Matthew Powell, O.P. 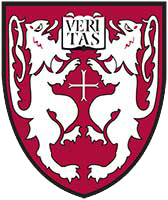 of Providence College. 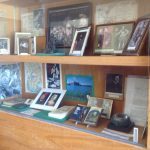 The collection of displayed in the foyer of the Burden Classroom building and in the school library. 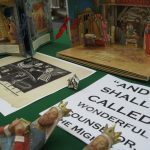 Father Matthew wrote the detailed history (below) of pop-up books and paper nativities that accompanies the collection. 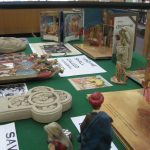 Three-dimensional paper nativity scenes originated in Germany and Austria in the early 1800s. They became the Christmas crèches of the poor who could not afford expensive hand carved figures. 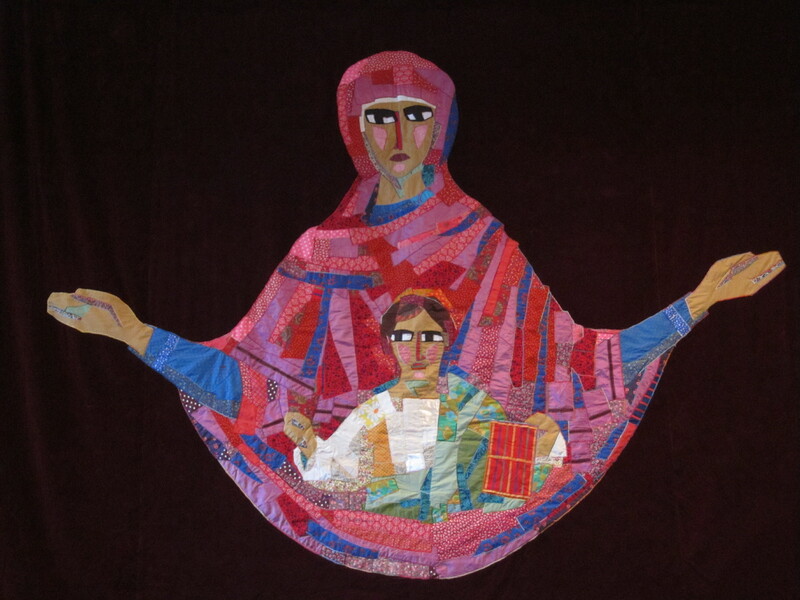 The perfection of the color printing process made paper nativities inexpensive to produce. 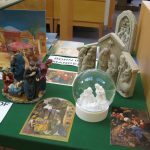 The printing of paper nativities spread to Bohemia (now in the Czech Republic) and then to the rest of Europe and North America. 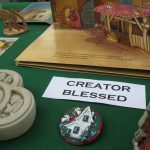 During Advent peddlers often went from door to door selling sheets of nativity figures. Some printing companies had as many as 200 different figures available. Color printed figures were the more expensive. Figures printed in black and white were less expensive and needed to be hand colored, which was usually the job of the children. 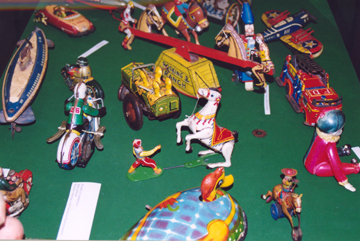 The development of mass-produced molded nativity figures in plaster and plastic in the twentieth century made the paper nativity scene less popular. Movable books actually predate the invention of the printing press. The earliest examples are the works of Ramon Llull (c1235-1316) of Majorca, a Catalan mystic and poet whose works contained volvelles or revolving discs, which he used to explain his complex philosophical ideas. 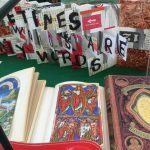 First designed for adults, movable books used flaps, gatefolds and volvelles and served as instructional tools as well as instruments. It wasn’t until the mid-18th century that movable books were designed especially for children. That first book was Harlequinade (1765) by London printer and bookseller Robert Sayer. The industrial revolution brought with it a moneyed, leisure class that indulged its children. 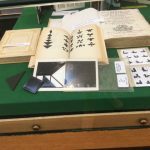 In addition color printing was perfected in Germany and the hand labor necessary to assemble the movable parts was cheap. 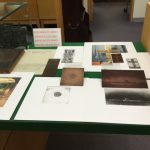 The latter part of the 19th century was the golden age of pop-ups because of the increase in the number and quality of movable books produced. 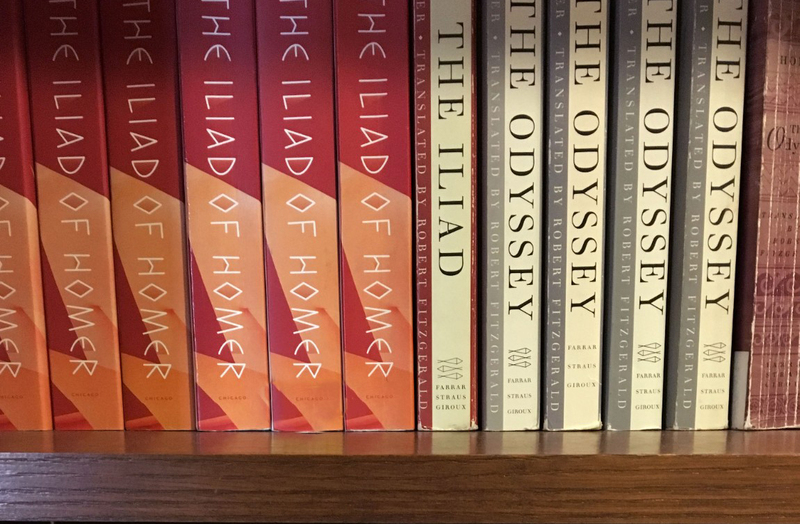 They were translated into many languages, producing a world-wide audience. German paper engineer, Lothar Meggendorfer, invented the use of a rivet around which a figure could move when a tab was pulled. 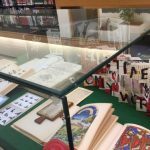 The first true “pop-up,” an illustration which jumps up when the page is opened, was invented by S. Louis Giraud and Theodore Brown in 1929 in England. However, the term “pop- up” was not used until the 1930’s when it was copyrighted by Blue Ribbon Press of Chicago. Few pop-ups were produced during World War II because of the shortage of both paper and labor. In the 1960’s, an English advertising entrepreneur, Waldo Hunt, discovered the work of Czech artist and paper engineer, Vojtech Kubasta (1914-1992). Hunt’s company, Graphics International, introduced Kubasta to the West and began producing pop-ups of its own. 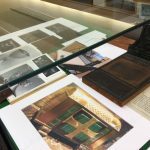 Hunt later teamed up with Bennett Cerf of Random House to create a pop-up series. 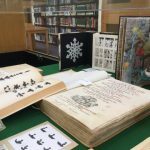 Now between 200 and 300 new pop-up books for both children and adults are produced in English each year. 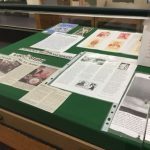 The largest collection of pop-up books is the Gustine Courson Weaver Collection at the University of North Texas Library.